I love this plaque which makes a great pair with the other one that is on the site. The round silvered metal medal is by Maurice Delannoy and depicts a woman in profile in the foreground with a gazelle behind her. The medal is signed "M Delannoy." 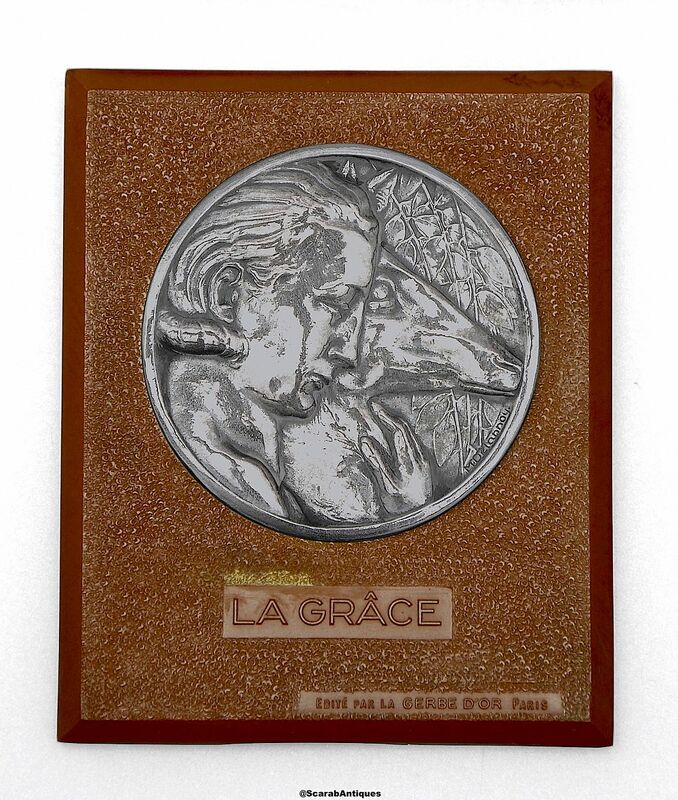 and is fastened to a rectangular chestnut coloured bakelite plaque that has the words "La Grace" embossed below the plaque and the words "Edite par La Gerbe d'Or Paris". The bakelite plaque has a triangular metal hook on the rear to enable it to be hung on the wall. I think that this plaque was promotion material for La Gerbe d'Or which was a jewellery shop in Paris. French sculptor and engraver of coins and medals. He was an associate of and exhibited at the Society of French Artists and received a bronze medal in 1923 and a silver medal in 1926.